The main skin class which provides methods and properties for all other skins. See docs/skin.txt for more information. Definition at line 38 of file Skin.php. Definition at line 146 of file Skin.php. Gets the link to the wiki's about page. Definition at line 1053 of file Skin.php. Definition at line 489 of file Skin.php. Definition at line 1329 of file Skin.php. References addToSidebarPlain(), ContextSource\msg(), and plain. Definition at line 1340 of file Skin.php. References $line, $lines, $link, $title, as, Sanitizer\escapeIdForAttribute(), ContextSource\getConfig(), ContextSource\getTitle(), ContextSource\msg(), Title\newFromText(), Title\newMainPage(), null, MessageCache\singleton(), wfMatchesDomainList(), and wfUrlProtocols(). This runs a hook to allow extensions placing their stuff after content and article metadata (e.g. categories). Note: This function has nothing to do with afterContent(). This hook is placed here in order to allow using the same hook for all skins, both the SkinTemplate based ones and the older ones, which directly use this class to get their data. The output of this function gets processed in SkinTemplate::outputPage() for the SkinTemplate based skins, all other skins should directly echo it. string Empty by default, if not changed by any hook function. Definition at line 641 of file Skin.php. References $data, Hooks\run(), and wfDebug(). Definition at line 676 of file Skin.php. BaseTemplate::getSidebar can be used to simplify the format and id generation in new skins. Note that extensions can control the sidebar contents using the SkinBuildSidebar hook and can technically insert anything in here; skin creators are expected to handle values described above. Definition at line 1282 of file Skin.php. References addToSidebar(), ContextSource\getConfig(), ContextSource\getLanguage(), null, Hooks\run(), MessageCache\singleton(), and WANObjectCache\TTL_UNCACHEABLE. Definition at line 1252 of file Skin.php. References $name, $title, and Title\newFromText(). Gets the link to the wiki's general disclaimers page. Definition at line 1061 of file Skin.php. string $section The designation of the section being pointed to, to be included in the link, like "&section=$section"
Definition at line 1611 of file Skin.php. References $attribs, $section, as, Linker\link(), ContextSource\msg(), and Hooks\run(). string Separated by >, terminate with "\\n"
Definition at line 583 of file Skin.php. References $parent, as, Linker\link(), and Title\newFromText(). Return URL options for the 'edit page' link. This may include an 'oldid' specifier, if the current page view is such. Definition at line 1072 of file Skin.php. References $options, getRevisionId(), and isRevisionCurrent(). Definition at line 811 of file Skin.php. Definition at line 1010 of file Skin.php. References $title, footerLinkTitle(), Linker\linkKnown(), and ContextSource\msg(). Referenced by aboutLink(), disclaimerLink(), and privacyLink(). Definition at line 1027 of file Skin.php. References $title, ContextSource\msg(), Title\newFromText(), null, and text. Referenced by footerLink(), and preloadExistence(). string HTML containing debug data, if enabled (otherwise empty). Definition at line 667 of file Skin.php. Useful for Special:Preferences and other places where you only want to show skins users can use. Definition at line 80 of file Skin.php. Referenced by ApiQuerySiteinfo\appendSkins(), MediaWiki\Preferences\DefaultPreferencesFactory\generateSkinOptions(), ApiParse\getAllowedParams(), and ApiQuerySiteinfoTest\testSkins(). Definition at line 1526 of file Skin.php. References $cache, $name, $services, ContextSource\getConfig(), ContextSource\getOutput(), ContextSource\msg(), Html\rawElement(), and use. Definition at line 606 of file Skin.php. References $out, getCategoryLinks(), ContextSource\getOutput(), ContextSource\getTitle(), ContextSource\getUser(), NS_CATEGORY, and Html\rawElement(). Definition at line 517 of file Skin.php. References $link, $out, $s, $t, $title, drawCategoryBrowser(), ContextSource\getConfig(), ContextSource\getOutput(), ContextSource\getTitle(), ContextSource\getUser(), Linker\link(), ContextSource\msg(), Title\newFromText(), and NS_CATEGORY. Definition at line 819 of file Skin.php. References $link, $title, $type, ContextSource\getConfig(), ContextSource\getTitle(), isRevisionCurrent(), Linker\linkKnown(), Linker\makeExternalLink(), ContextSource\msg(), Title\newFromText(), and Hooks\run(). Definition at line 865 of file Skin.php. Defines the ResourceLoader modules that should be added to the skin It is recommended that skins wishing to override call parent::getDefaultModules() and substitute out any modules they wish to change by using a key to look them up. Definition at line 176 of file Skin.php. References $modules, $out, $user, ContextSource\getOutput(), getRelevantTitle(), and ContextSource\getUser(). Definition at line 415 of file Skin.php. Definition at line 473 of file Skin.php. Definition at line 497 of file Skin.php. Definition at line 1433 of file Skin.php. 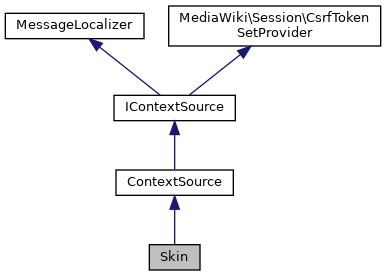 References $newtalks, $out, $user, as, Xml\element(), ContextSource\getOutput(), ContextSource\getUser(), WikiMap\isCurrentWikiId(), Linker\linkKnown(), ContextSource\msg(), Revision\newFromTitle(), null, and Hooks\run(). Definition at line 437 of file Skin.php. References $name, $title, $type, $user, Sanitizer\escapeClass(), ContextSource\getUser(), and list. Definition at line 895 of file Skin.php. A "relevant" title is not necessarily the actual title of the page. Special pages like Special:MovePage use set the page they are acting on as their "relevant" title, this allows the skin system to display things such as content tabs which belong to to that page instead of displaying a basic special page tab which has almost no meaning. Definition at line 342 of file Skin.php. Referenced by SkinTemplate\buildContentNavigationUrls(), getDefaultModules(), getRelevantUser(), and preloadExistence(). A "relevant" user is similar to a relevant title. Special pages like Special:Contributions mark the user which they are relevant to so that things like the toolbox can display the information they usually are only able to display on a user's userpage and talkpage. Definition at line 363 of file Skin.php. References $mRelevantUser, $out, $title, $user, getRelevantTitle(), User\isIP(), User\newFromName(), NS_USER, null, and outputPage(). Definition at line 309 of file Skin.php. Referenced by SkinTemplate\buildNavUrls(), editUrlOptions(), isRevisionCurrent(), lastModified(), and printSource(). Definition at line 803 of file Skin.php. Definition at line 1575 of file Skin.php. References getCachedNotice(), ContextSource\getUser(), and Hooks\run(). Definition at line 155 of file Skin.php. Definition at line 65 of file Skin.php. Definition at line 57 of file Skin.php. Referenced by ResourceLoaderContext\__construct(), ApiQuerySiteinfo\appendSkins(), ResourceLoaderFileModule\getAllSkinStyleFiles(), EditPage\isWrongCaseUserConfigPage(), and ApiQuerySiteinfoTest\testSkins(). Return a fully resolved style path URL to images or styles stored in the current skin's folder. This method returns a URL resolved using the configured skin style path. Requires $stylename to be set, otherwise throws MWException. Definition at line 1110 of file Skin.php. References class, ContextSource\getConfig(), and null. Definition at line 716 of file Skin.php. References $title, ContextSource\getRequest(), ContextSource\getTitle(), SpecialPage\getTitleFor(), ContextSource\getUser(), Linker\linkKnown(), and ContextSource\msg(). Definition at line 162 of file Skin.php. Definition at line 318 of file Skin.php. Referenced by SkinTemplate\buildContentNavigationUrls(), editUrlOptions(), getCopyright(), and SkinTemplate\prepareQuickTemplate(). Definition at line 918 of file Skin.php. References $s, $t, ContextSource\getLanguage(), ContextSource\getOutput(), getRevisionId(), Revision\getTimestampFromId(), ContextSource\getTitle(), ContextSource\getUser(), ContextSource\msg(), and null. Definition at line 945 of file Skin.php. References $s, getLogo(), ContextSource\msg(), and Title\newMainPage(). Gets the link to the wiki's main page. Definition at line 995 of file Skin.php. References $s, Linker\linkKnown(), ContextSource\msg(), and Title\newMainPage(). Renders a $wgFooterIcons icon according to the method's arguments. array $icon The icon to build the html for, see $wgFooterIcons for the format of this array. bool | string $withImage Whether to use the icon's image or output a text-only footericon. Definition at line 970 of file Skin.php. References $html, Html\element(), ContextSource\getConfig(), null, and Html\rawElement(). Definition at line 1168 of file Skin.php. References $name, $title, Title\newFromText(), text, and wfMessage(). Definition at line 1192 of file Skin.php. Referenced by EmailNotification\composeCommonMailtext(), LoginSignupSpecialPage\getFieldDefinitions(), EditPage\showIntro(), and EditPage\showStandardInputs(). Definition at line 1236 of file Skin.php. References $name, $title, Title\newFromText(), and true. Definition at line 1125 of file Skin.php. Definition at line 1207 of file Skin.php. References $name, $title, and Title\makeTitleSafe(). If $proto is set to null, make a local URL. Otherwise, make a full URL with the protocol specified. Definition at line 1143 of file Skin.php. References $name, $title, and SpecialPage\getSafeTitleFor(). Definition at line 1158 of file Skin.php. Definition at line 1179 of file Skin.php. Referenced by Action\addHelpLink(), SpecialPage\addHelpLink(), and Article\addHelpLink(). Definition at line 1220 of file Skin.php. Definition at line 399 of file Skin.php. References $data, ResourceLoader\makeConfigSetScript(), and ResourceLoader\makeInlineScript(). If a skin can't be found, it will fall back to the configured default ($wgDefaultSkin), or the hardcoded default ($wgFallbackSkin) if the default skin is unavailable too. string $key 'monobook', 'vector', etc. Definition at line 101 of file Skin.php. References $fallback, $wgDefaultSkin, and $wgFallbackSkin. Referenced by ApiQuerySiteinfo\appendSkins(), ApiParse\execute(), User\getDefaultOptions(), RequestContext\getSkin(), and ApiQuerySiteinfoTest\testSkins(). Definition at line 264 of file Skin.php. References $title, $titles, $user, as, footerLinkTitle(), getRelevantTitle(), ContextSource\getUser(), and Hooks\run(). Text with the permalink to the source page, usually shown on the footer of a printed page. Definition at line 698 of file Skin.php. References getRevisionId(), ContextSource\getTitle(), ContextSource\msg(), and wfExpandIRI(). Definition at line 1045 of file Skin.php. Definition at line 328 of file Skin.php. Definition at line 351 of file Skin.php. Definition at line 428 of file Skin.php. Definition at line 510 of file Skin.php. Definition at line 1086 of file Skin.php. References ContextSource\getUser(), User\newFromId(), and SpecialEmailUser\validateTarget(). Definition at line 747 of file Skin.php. References $lang, $link, $out, $title, as, ContextSource\getLanguage(), ContextSource\getOutput(), MWNamespace\hasSubpages(), Linker\linkKnown(), ContextSource\msg(), Title\newFromText(), null, and Hooks\run(). Definition at line 44 of file Skin.php. Definition at line 45 of file Skin.php. Definition at line 42 of file Skin.php. 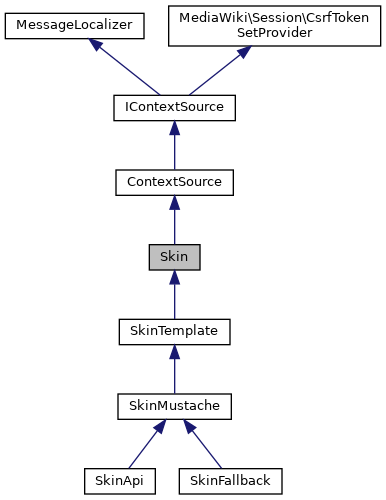 Referenced by __construct(), and getSkinName(). Subdirectory in skins/ where various stylesheets are located. Only needs to be set if you intend to use the getSkinStylePath() method. Definition at line 51 of file Skin.php.